Urbana Corporation issued a press release yesterday announcing that they have bought a 15.6% stake in Caldwell Financial Ltd. Urbana is managed by Thomas S. Caldwell who also owns 45.14 percent of Caldwell Financial. So this transaction looks in my opinion pretty bad: it could be a nice way for insiders to cash out of Caldwell Financial at the expense of the Urbana shareholders. I don’t know if this is indeed what happened. The press release is short on details and while insiders own a total of 69.3% of Caldwell Financial they could have bought the 15.6% stake from a third party. While my initial thought was that as an Urbana shareholder I was getting screwed pretty bad the potential loss of value seems minimal. In the weekly NAV update the company already disclosed earlier this week that they own 700,000 shares of Caldwell Financial with a cost price of just 1.5M (just a bit more than 1.3% of NAV) and based on Urbana’s latest Annual Information Form this position is indeed the 15.6% stake. It discloses that TSC owns 45% or 2.2M shares of Caldwell Financial. Based on this the 700,000 shares would translate to a 14.4% position: close enough to the announced 15.6% number. So while I still think the transaction is very questionable there is no big loss of value, and I’m not yet selling my position. But Urbana is certainly moving up in the list of things I could sell if I find another good idea. This entry was posted in Portfolio and tagged URB-A.TO, URB.TO on June 29, 2012 by Alpha Vulture. AP Alternative Assets is a closed-end limited partnership that was established by Apollo Global Management in 2006. 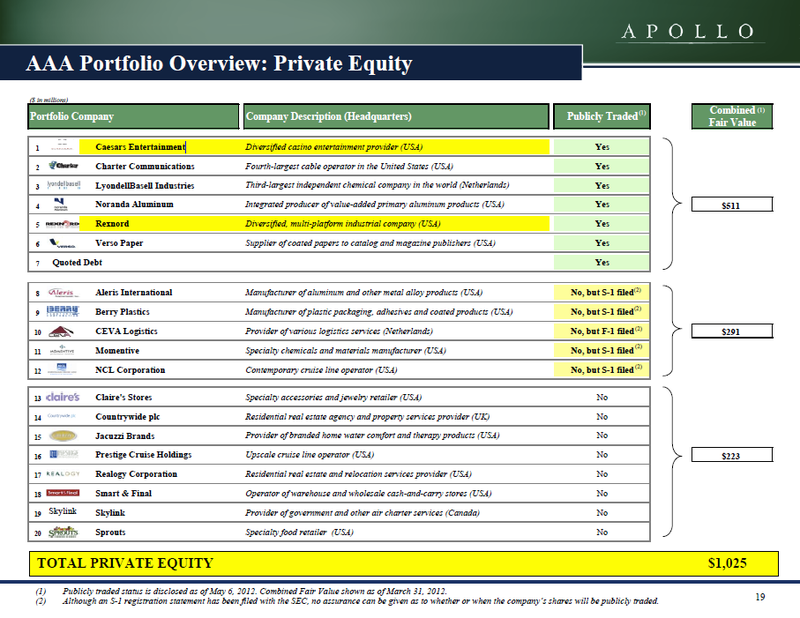 Apollo describes itself as contrarian value-oriented investors and a leading global alternative asset manager. The company has 75 billion of assets under management. 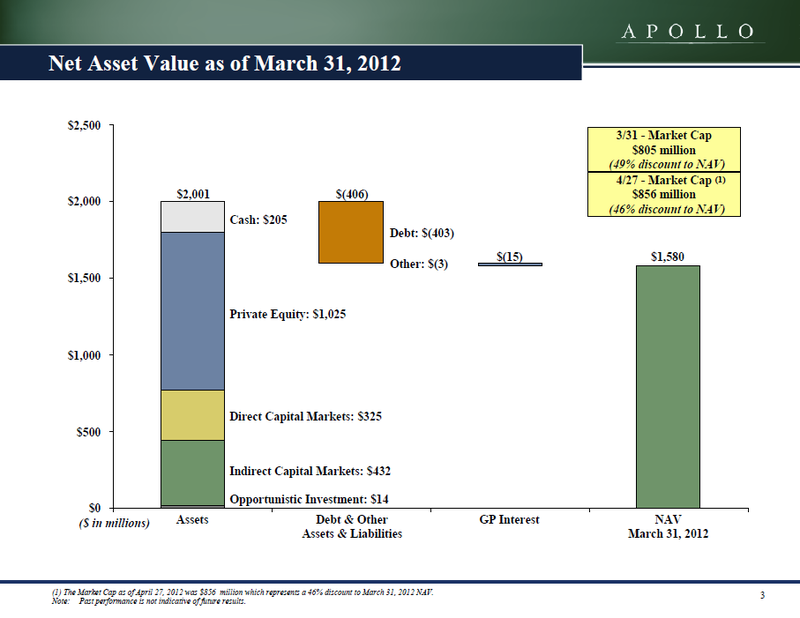 AP Alternative Assets invests in and alongside various Apollo funds and is relative small with a NAV of 1.6 billion at March 31. What attracted my attention is that the fund was trading at a 46% discount to NAV at the end of April. AP Alternative Assets provides a nice overview of it’s holdings in the latest quarterly report and has a good presentation online as well that includes the diagram below. Unfortunately the disclosure on the details of the portfolio is poor. AAA does not disclose how much shares it owns, and in it’s quarterly report it only provides a fair value estimation for positions bigger than 5%. In the publicly traded part of the portfolio the only company that meets that criteria is Rexnord with a fair value of $164 million at 31 March 2012, but since that date the share price has dropped 38%. Four out of the five other public companies also have seen their share prices drop with an average of 14.4 percent. Since we don’t know how big the public debt part of the portfolio is or how the other positions are exactly sized it’s hard to calculate what the current NAV is. We also have to worry that the private part of the portfolio has seen similair declines in asset value. The S&P 500 is down 7 percent since 31 March, and given the leverage that the companies employ it’s probably reasonable to assume that this part of the portfolio could also be down 15 percent since March. While I think that the asset value has gone down since the latest quarterly report the share price has gone up a bit and is now at $10.33, resulting in a 36% discount if the quick and dirty math above is correct. I’m afraid though that this could be a bit on the positive side since it’s ignoring the leverage that the fund itself has, although on the other hand it’s also ignoring that the fund not only has positions in equity but also in bonds (21% is in debt investments, and those should have a lower volatility). Because I’m worried that the discount to NAV might have been getting significantly smaller the past months I’m at the moment keeping AAA on my watch list. The average discount for the past 3 years has been 48%, so I might be wrong about what happened to the portfolio value, or I might get an opportunity soon enough again. At an almost 50% discount I think the fund would be a compelling investment. Just the discount alone would be pretty good, but there are some more interesting things that I have skipped in this write-up since I’m not going to buy at the moment. But if the tender offer line in the valuation above wasn’t a hint enough: the fund is aggressively buying back it’s own shares and reducing debt. Because the private equity portfolio is quite mature there should be a lot of cash flows in the next few years to reduce debt and either close the discount or create a lot of value by buying back shares. This entry was posted in Research and tagged AAA.AS on June 26, 2012 by Alpha Vulture. While the JAKK and CACC tenders haven’t yet completed a bunch of new tender offers with odd lot provisions have already been announced for July. They are for closed-end funds, and instead of a fixed dollar value per share you will get a percentage of NAV. Since they are all trading at a discount this creates an opportunity with positive expected value, but you do have market risk while holding the position. Because of that I’m going to wait till the last moment before buying, since I don’t expect that the discount will significantly change between now and the close of the tender offer. Total expected value for all the closed-end fund tenders is 764 dollars before transaction costs, or an ~8.4% return on a ~$9,000 dollar position that you have to hold for just a few days if you want to play it safe (although I actually think you don’t need to wait before the trade settles before you can tender, so you could buy on the last day). Not long any of the funds, but will buy between now and the deadlines. This entry was posted in Research and tagged CHN, IIF, LDF, MSF, RNE, TKF on June 24, 2012 by Alpha Vulture. Credit Acceptance Corporation (CACC) has announced a tender offer to buy back 1,000,000 shares at a price of $84.45/share. The stock is currently trading at $80.12, and if you own less that 100 shares you will not get prorated if you tender. So this could be an easy opportunity to make a bit more than $400. There are however always some conditions that make it possible for the company to cancel the tender offer (see for full details the SEC filing). If the stock is for example down more than 10% after May 31 the tender offer can be cancelled, and so far it’s down 5% already. So it’s certainly not risk free, but at the same time it’s also certain that as an odd lot holder you will have an edge. This entry was posted in Portfolio and tagged CACC on June 5, 2012 by Alpha Vulture. To continue with the two sentence posts: if you are a Solitron owner, or considering to become one, you should check out this post at Oddball Stocks. Some not so great developments with regards to corporate governance. This entry was posted in Portfolio and tagged SODI.OB on June 3, 2012 by Alpha Vulture.